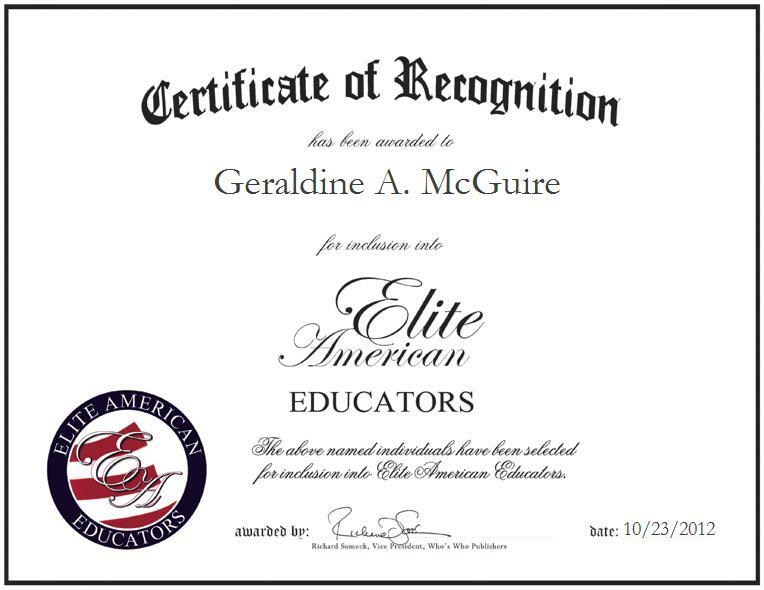 METHUEN, MA, November 2, 2012, Geraldine A. McGuire, Special Education Teacher serving the Greater Lawrence Educational Collaborative, has been recognized by Elite American Educators for dedication, achievements, and leadership in special education. With a wealth of knowledge and experience in the area of special education, Ms. McGuire proudly lends her expertise to the renowned public educational service agency, which provides special and general education, and vocational transition programs. In her current capacity, Ms. McGuire is in charge of teaching students with special needs, delayed development, cerebral palsy and other multiple disabilities. She also expertly administers personal care, prepares individual education plans for students, and tracks and evaluates student progress. For her outstanding efforts, Ms. McGuire has garnered a reputation of distinction, and she continues to strive for excellence in her every endeavor. She was nominated for the Disney Teacher of the Year Award in 2002. Ms. McGuire has amassed more than 45 years of professional experience, and she continues to make great strides toward success in her field, and valuable contributions in special education, as she is committed to helping students to achieve greatness. She pinpoints the highlight of her career as receiving letters of appreciation from two of her former students who recovered from drug abuse and Asperger’s syndrome respectively. She attributes her success to her dedication, sense of humor, competence, learning skills and willingness to listen to her students. Ms. McGuire earned a Bachelor of Science in Elementary Education from the University of Massachusetts Lowell, a Master of Science in Special Education from Simmons College in Boston, and a Master of Education in Counseling Psychology from Cambridge College. She was inspired to pursue her current career path by her desire to make the most of her academic background. She taught second grade at the Timberlane Regional School District, where she also taught special needs students and first grade. She was a moderate special needs student for the Town of North Andover, as well.